- Even if I find a better/cheaper hotel than one already booked, we will be forced to go to where we have the booking. In many towns though we could find better options as we enter town, we had to spend extra time finding out where is our pre-booked hotel and reaching it, even if it is a bit far. But of late, I have tried few road trips without too much planning. In November, after Bali trip got cancelled, I booked a car and hit the road, with no specific schedule or plan. 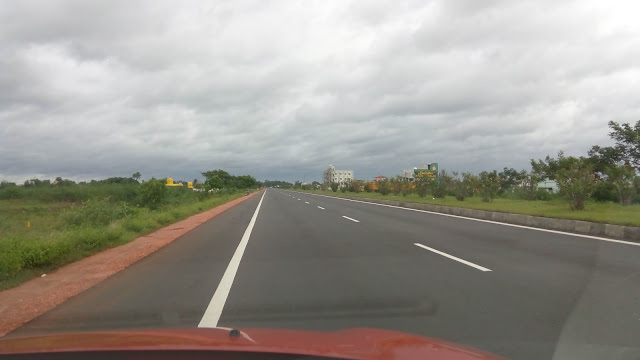 We wanted to head to Rameshwaram straight, but decided to stop at Trichy. As we found a well maintained budget accommodation (Yatri Nivas) we decided to visit Tanjavore, come back, spend a night in Trichy and head to Rameshwaram next day. We reached Rameshwaram on a weekend, but still could get some decent rooms (though our preferred Hotel Tamil Nadu was sold out). We spent few more days with adhoc planning, staying at hotels in Dindigul, and a highway hotel near Erode. There was a small fear as to what to do if we all hotels are sold out. But it was not peak tourist season and such a probability was low. Also we had a backup plan to get into the car and drive to next city, so there was no worries. Before selecting the room we could physically verify that rooms are decent, at times negotiate a bit. So this mode of unplanned trip was also fun. It gave us lots of flexibility. Another point I noted was that many super cheap budget hotels in small towns are not yet listed properly on major hotel booking portals. So if you try to book online you will usually find only few expensive options. Even when listed, sometimes they put photos of their most expensive room and put rent of least expensive room, trying to mislead. Visiting in person gets you clear idea of what's on offer and if it is worth. I know many friends who venture out without too much of planning. I think that has an element of adventure in itself. What is your take? Would you plan everything before leaving home or would you like to enjoy a trip as it unfolds? Thanks Prashanth and Sandeep for your comments. I want to do a unplanned trip but have put on hold for harsh to grow up a bit. Probably a mix of both? It's all about finding a right balance maybe.